Heaney lived in the small town of <?xml:namespace prefix = st1 /> Berlin, WI. I live in Germantown, just North of Milwaukee. I have seen 8mm movies of Heaney performing. They were made in the 50’s and 60’s. he appeared very skilled in stage manipulation sleight of hand. Heaney died in the mid 1970’s. I have been to Berlin, WI, there are still some “old timers’ who knew him well. He was known as the “town drunk” and got in trouble quite a bit for drinking and driving, had gotten into some accidents and such. This was before law enforcement took drunk driving as serious as the do today. Heaney had a mail order magic company that he had run out of Berlin, WI since the 1920’s. He also was a close friend of both famous magician Thurston and Blackstone (Sr.) Heaney had all of Thurston’s illusion show in his barn. I had known about this when I was a kid, because I had read about this in an old magic magazine from the 1940’s. In addition, and “old timer” magician had told me the story as well. I never got a chance to go to Berlin and track him down before he died. It may have been hard to get any of the stuff, however, Heaney was a “pack rat” and never parted with anything. He would also chase magicians away who were in search of collectibles. In the early 1980’s, some magic collectors with deep pockets (I believe David Copperfield was one of them) purchased the antique collection from Heaney’s widow. There were tons of stone lithograph posters, which are worth a fortune today. The barn also had many large, antique stage illusions and elaborate stage sets, which were used by Thurston. Most of the “George” the magician posters you see around today came out of that barn- Thurston had actually bought out George in the 1920’s, and acquired all of his posters. Most of the Thurston “Good luck” cards you see came from there too. Last summer I stopped in Berlin and started asking around about Heaney at antique stores, and other places. There is a clinic on the grounds where the barn was. I do believe the county historical society has Heaney’s old truck and trailer, which was painted up “Heaney, Worlds Foremost Magician”. 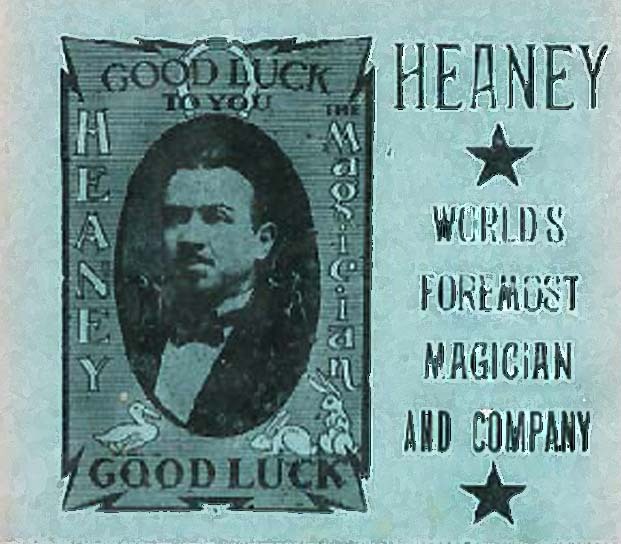 I did know a magician who died several years ago, he saw Heaney when he was a kid, and considered him a good performer. Hope this sheds some light on just “who” Heaney the Magician was. There was another magician and escape artist from Oshkosh, WI, who went by the name of “Mighty Oaks”. He ran a mail order magic company too. It is rumored that Oaks and Heaney ended up being partners, or perhaps Heaney bought the business from Oaks. Oshkosh is very close to Berlin. We also had a magician who lived way up North and passed away in the 70’s. The fellow worked all the big resorts when they were popular in the 40’s, 50’s, and 60’s. This magician was a close friend of Houdini, and had much of Houdini’s milk cans and escapes stored in a semi trailer up in Eagle River, WI. I do know where these items went, they are in the Magic Museum in Marshall, MI. These too, are probably worth a fortune.